Paris, November 2014. 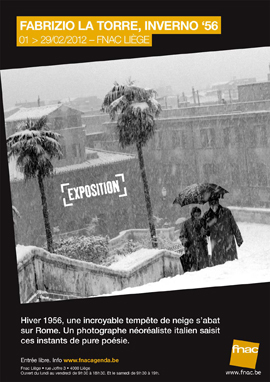 “Sélection Romaine”. 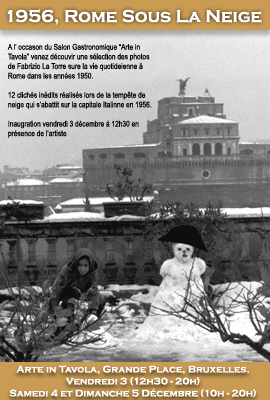 On the occasion of the “Photography Month in Paris” the charming “Au fond de la cour”, gallery, run by Marie-Laure de L'Ecotais, will exhibit a selection featuring 25 of the most significant photos of Fabrizio La Torre’s work in Rome. For collectors and enthusiasts, numbered and signed prints by the artist on barium cards will be available. From 6 to 29 November 2014. 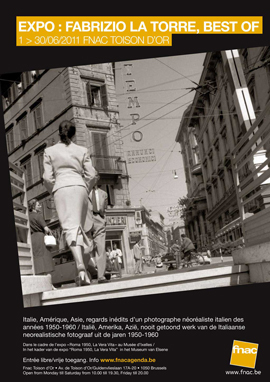 "Gallery Marie-Laure de L'Ecotais "
For the first time ever, a truly comprehensive retrospective of the works of Fabrizio La Torre, photographed ​​in Italy, America and Asia in the 1950s and 1960s, is to be held, The exhibition will be accommodated in a superb 800 m² viewing area in the heart of the Principality of Monaco at Port Hercule. 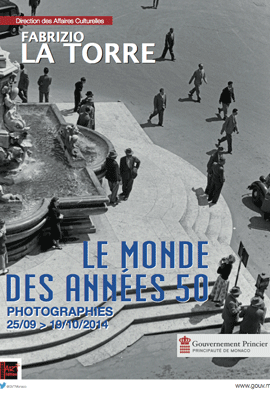 220 photographs, including many previously unpublished images, will be on display. September 24 to October 19, 2014. Free admission. Liège, FNAC Forum, February 2012. FNAC Liège offered visitors a selection of works by Fabrizio La Torre. These photos were taken on a morning in 1956 when the Eternal City woke up to find itself under a blanket of snow. Rare and magical. From February 1 to 29. Brussels, Musée d’Ixelles. June-September 2011. 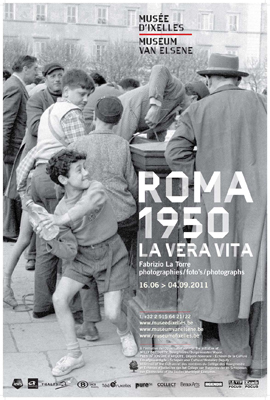 Under the title “La Vera Vita”, the Musée d'Ixelles (in the Brussels district of that name) invited you to see Fabrizio La Torre’s place of birth, through his eyes, as it was in the 1950s. 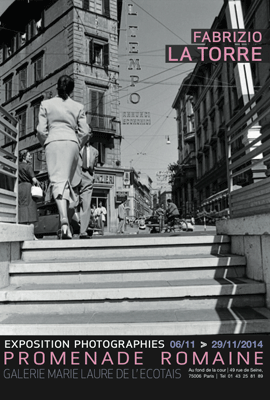 At that time, as the artist recalls, people did not mind being photographed. They did not feel they were being robbed of their image, as became the case a few years later with the arrival of the “paparazzi”. The Musée d’Ixelles specialises in twentieth century art and has a solid international reputation. It was a great honour to have the museum displaying Fabrizio La Torre’s work during the three months of that summer. FNAC Toison d’Or offered its visitors a small selection of 30 photographs taken by Fabrizio La Torre in Europe, America and Asia. For the occasion, FNAC also gave its customers a chance to participate in a contest, linked to the artist’s pictures, to win a Piaggio! Brussels, Grand Place, December 2011. On the occasion of the “salon de gastronomie italienne” Arte in Tavola, presented a selection of photographs of Rome as well as a chance to meet the artist over a glass of fine Prosecco. Fabrizio La Torre’s first venture into the limelight! 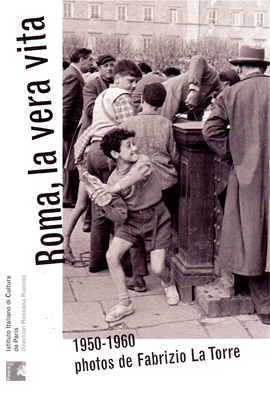 At a time when the restoration of his photographic archives had only begun a year earlier, the Italian Embassy in Paris and Mrs. Rossana Rummo, Director of the Cultural Institute, offered Parisians the opportunity to discover the first shots of Rome by the artist, giving us a chance to appreciate the force of a nostalgic, neo-realist perspective on a bygone era. 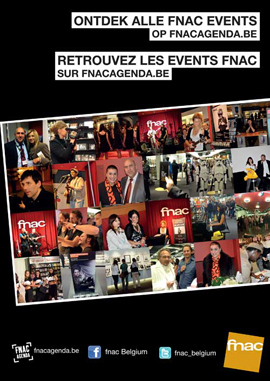 Brussels Art Edition are very happy and flattered to be featured on the poster issued by their friends at FNAC.be representing the cultural events they organise in Belgium.